Rainy Day, Partner home, Bellini (fake thermomix) prepped…. Game on! We’re two weeks into our 30 day challenge, the final day of Alexx Stuarts Real Food Rockstars Course is tomorrow and one of the things she suggests is to try and cook one new recipe a week. I’m not a nutritionist or even a massive foodie, so this is a big deal for me! Pate – Alexx Stuarts fool proof chicken liver pate. Bliss Bars – bars because who has the time to roll balls! 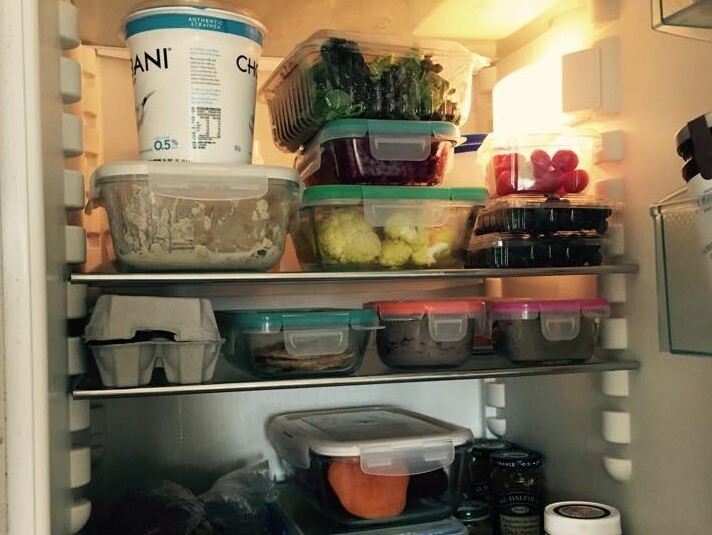 It feels so good having a fridge full of nutritious goodness and easy go to dipping snacks! I still have a few processed bits to switch out and make better choices, but it’s getting there! Fact – it is frustrating taking the time to think, research and find the recipes to try, which is one of the reasons I’m saving them here, so I can easily find the crowd pleasers again! Excuse the masking tape labelling! Classic thing…. I was so pooped after mixing everything up I had a smoothy! Hahaha but I have enjoyed the snacks since! So far everything has had a thumbs up from my man and toddler…. the dog turned up his nose at a roasted carrot, but seemed to like everything else that hit the floor at dinner time. My toddler spat out some of the seeds in the bircher muesli and made a right mess, but ate most of it. Last night, my tummy felt flat-ish…. I still have a Mum Tum, but it felt so good to not feel puffy, bloated and a bit sick! Jumping on the scales this morning I was the lightest I’d been since before I was pregnant – WINNING! I turn 40 in a few weeks and ordered myself a Le Crueset french oven, never thought that would be on my wish list of things I really wanted. Weird ways having baby changes you right! Bring on the challenges! Let me know if you have any super tasty recipes… I’m a new mum on a healthy food mission!